Do you feel like your bathroom decor could need some help? Are you looking for inexpensive bathroom decor ideas? Whether your bathroom is old or new, there are some very inexpensive ways to update any bathroom. Why not see what you can do to improve your bathroom decor without breaking the bank. Sometimes we feel like if we decide to tackle a bathroom project, that we have to eat the whole elephant all at once. Have you heard that phrase? How do you eat an elephant? One bite at a time. Now, tackling a whole bathroom renovation project can seem daunting, time consuming, inconvenient, and expensive! I know. I have done a few. When I did a complete master bathroom remodel, it was a whole elephant, and I felt like I was eating the whole dang thing all at once! Now, if only we could all be able to create our dream bathrooms, with the perfect bathroom accessories and bathroom decor ideas! If we were all experts at bathroom interior design, wouldn’t that be just dandy? I have found so many sources for bathroom ideas, and obviously I love to peruse Pinterest, and other design sites like Houzz. And sometimes seeing those beautiful bathroom layouts, with their incredible finishes and bathroom accessories can make you feel a little inadequate. But that does not have to be the case. There are easy solutions that can get more life out of a drab or unfriendly bathroom, and they are easier and less expensive than you think. What about a powder room? Do you have a small space such as a half bath that could use an update? I did just that when I updated my entry powder room. The changes were small but they made a large impact. And what about my boys bathroom? I transformed the entire space for under 100 dollars! Can you believe that? There is proof that these inexpensive bathroom ideas work! 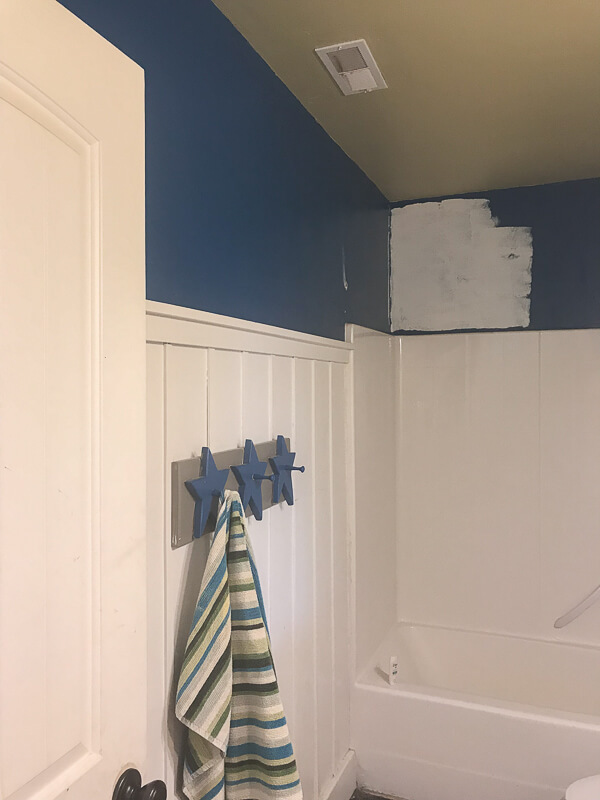 I want to take you on a journey, instead of just telling you what to do, I want to show you how I used these methods to update one of our bathrooms. I hope by now, you know I don’t mess around. 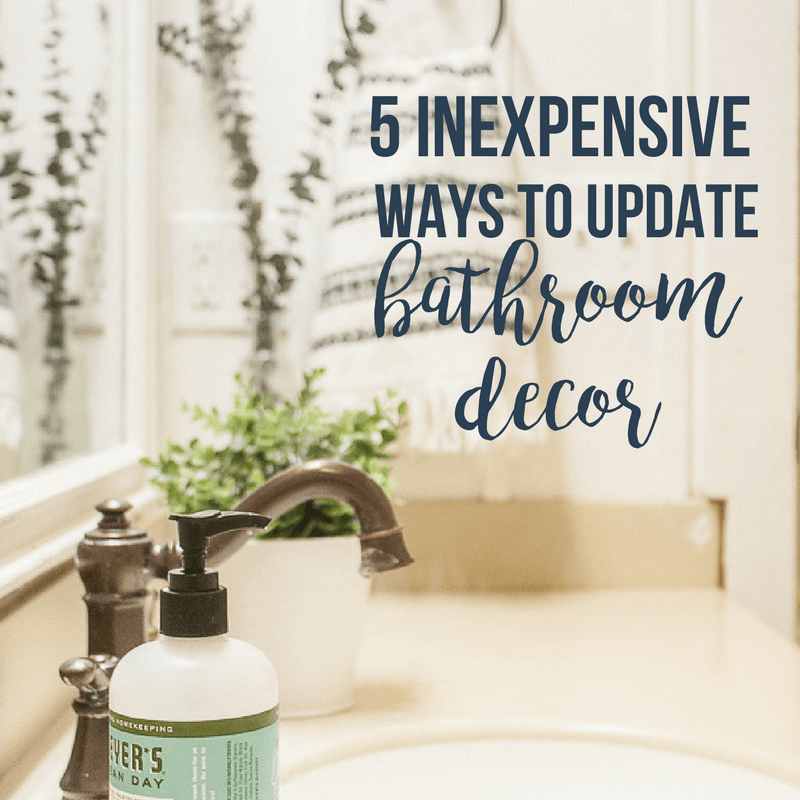 These 5 inexpensive ways to update your bathroom decor are exactly what I used to create a more updated bathroom for my son and daughter. I wanted something that would be good for both girls and boys. A more neutral pallet is what I was looking for. Their bathroom used to be very gender specific and had bright blue and green accents that I had used when the kids were small. But they had outgrown it. Now having a teenager in the house, I thought it time to give it a more grown up look. This look is grown up and also fits my homes decor. 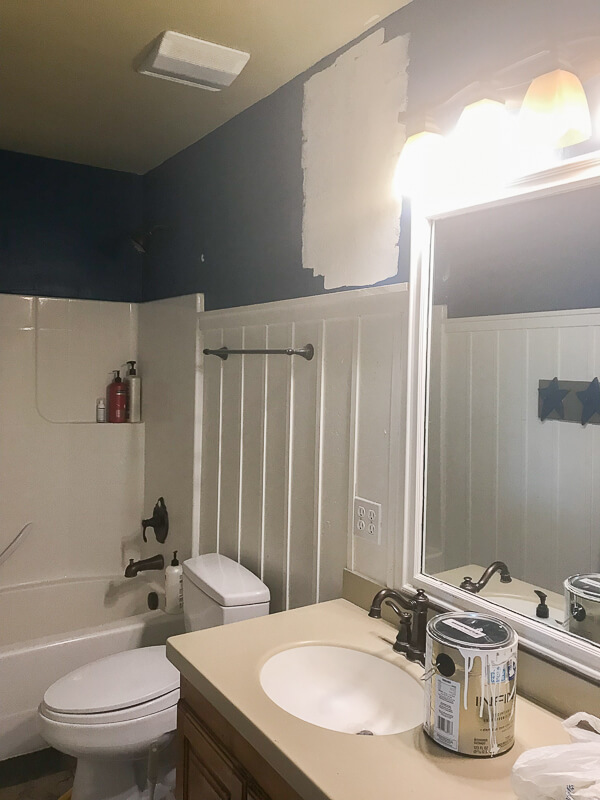 Check out the 5 things I did to change this bathroom without breaking the bank. Paint is the easiest and most effective and dramatic way to update bathroom decor without breaking the budget. A gallon of paint can range anywhere from 20-50 dollars depending on the quality of the paint. I would recommend using a good quality paint, since you will get more for your money. Generally a good quality paint will have better coverage and go on better. I cannot say enough about how much just a coat of paint can completely transform a space. You can see that I painted the upper walls white to brighten up the room. There are no windows, which means no natural light….so it needed a fresh coat of paint in my opinion. But, you so not have to use white paint to update your bathroom. You can use whatever you want. Even if you have an ugly tile, or maybe a vintage pink or green tile you don’t love and want to do something about it, by adding a complimentary color or lightening up the space with a neutral color, you can add some style to the space without tearing the whole thing out. You can get more mileage from it this way. This may seem obvious but changing out a dingy shower curtain for a more stylish one can be a great way to update your bathroom accessories and bathroom decor while staying in budget. Can you believe I found this black and white shower curtain at Walmart? They have definitely upped their game and are bringing some pretty great products to their stores. You can find so many different options for shower curtains and they are a great way to update drab bathroom decor. I also did this in my boys bathroom. 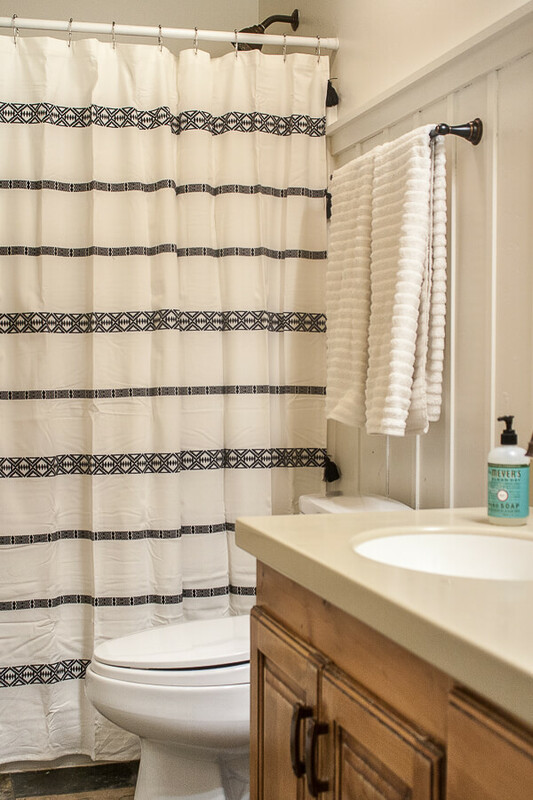 A super cute shower curtain can really change the look of the whole room. Believe it or not, simple bathroom accessories are important to the overall look of a space. 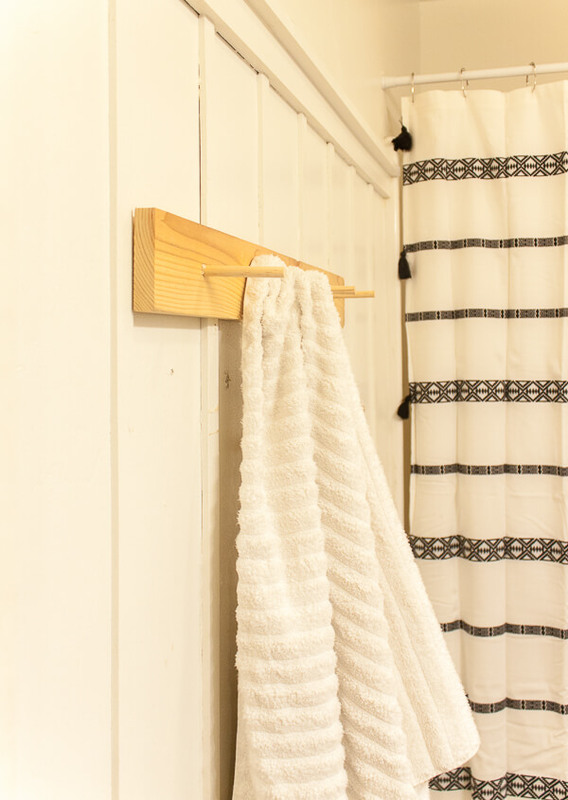 Adding a decorative towel hook can add style to a bland bathroom. Sometimes by adding focus to other parts of the bathroom can take the focus away from the parts that may not be so pretty. 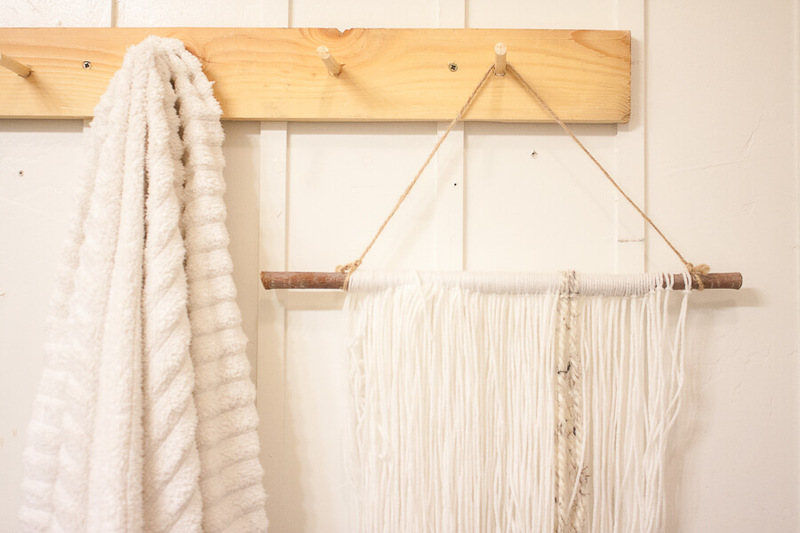 I create this simple peg towel hook rack the same way that I did my new entry peg hat rack. If you aren’t interested in a DIY project check out whats available online or in stores. There are so many inexpensive options out there to choose from. I cannot say enough about what new towels will do to a space. 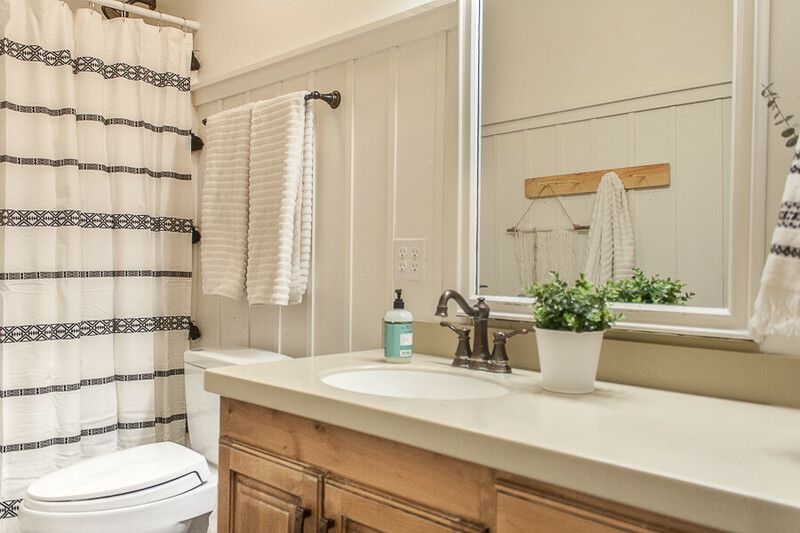 A fresh set of white towels can brighten any space. I love to display my towels on my open shelves or over a towel rod. If you can find a towel with some texture or design that can be even better. Believe it or not, I love buying my towels at Walmart, and all the towels in my bathroom images are from Walmart. They ribbed towels are wonderful quality. And with a bunch of kids, primarily boys, it gives me a little peace knowing I don’t have to panic every time they use one or ruin one. Just like new towels, a new rug can totally transform your bathroom decor. You can choose a bright patterned design or a simple white or jute rug. I often change out my rugs in my bathrooms since I think they get the most wear and tear, they need to be replaced more often. There are also some inexpensive DIY projects you could do in your bathroom to update it without breaking the bank. You can create beadboard or shiplap that add interest to plain walls and give your bathroom a wonderful farmhouse look. I have an easy shiplap tutorial, you should definitely check it out! We installed board and batten in this bathroom and it immediately created more interest in the bathroom decor. There are so many different things you can do to update an old bathroom decor without tearing out the whole space. I just wanted to share a little bit of how I do it. These decorating ideas are just a few of the hundreds of things you can do to a bathroom. I hope that they have sparked a few decorating ideas of your own. I would love to hear them! Hi, Sara! Yet another list of great ideas! These changes are so easy to make, yet they`re changing a whole look of the bathroom. I really like some of your suggestions. This is a beautiful neutral style that you can make suitable for everyone`s taste. I appreciate all the thoughts of diyers. You guys are so creative to give anything a great look. I am not a rich person and always looking for cheap renovation ideas. These article was enough to encourage me anyway. I am thinking of a homemade wooden toothbrush holder. What do you think that can add some value with this idea? Hello there! I just love visiting your site for such doable inspiration. I was wondering what paint colors you used in your teen bathroom? I am looking for great neutral combos and you hit the spot right on with the board and batten to the tribal shower curtain. Looking forward to what diy youll come up with next! HI there, I used True Values, Antique White paint color for the bathroom. Thanks so much for your kind words! I love the idea of changing my bathroom curtain every so often, as it creates a whole new different vibe every time 🙂 And yes, paint goes a long way. It makes a kit of difference. Great ideas here! I can’t wait to help my cousin decorate her apartment next month with these tips! Thanks for sharing your useful post. Wow, These are looking gorgeous. 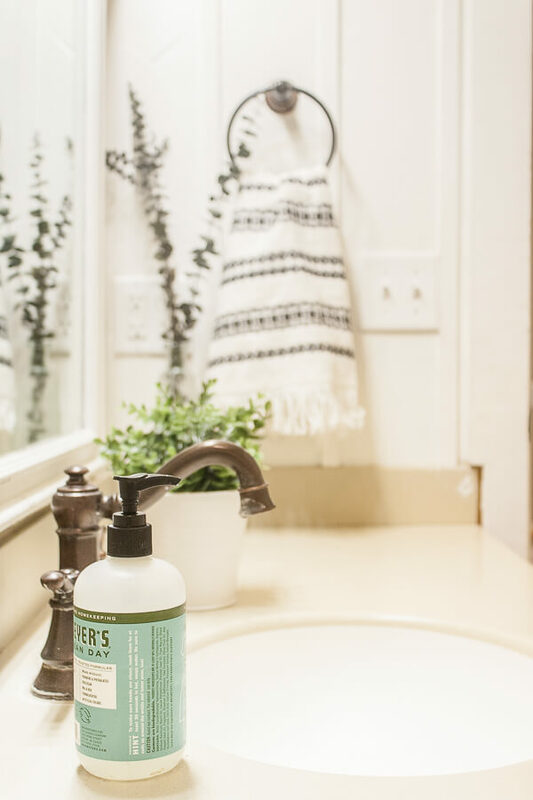 Everything you use in your bathroom is awe-inspiring. I want to make my guest bathroom like this. I will keep it in my mind and apply this when I am going to make my guest bathroom. Hope so that it will be a gorgeous one. Thanks for the sharing this. Amazing article, Loved your ideas on updating the bathroom, Really Helpful. Thanks for sharing. Also, let me know any good idea about installing the best porcelain gloss tiles in the bathroom area. Hi Sara, hope you get this since I am responding to an old post. I am a brand new reader and just love your home an everything you have done! I would love to know if the finish on the vanity is something you did or is it a commercial finish? I love it! Hi! It was created by the cabinet maker. Hey Sara! you have shared a list of great ideas. I really liked you ideas as they are easy and cheap.